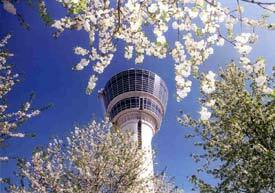 ABOVE: Control tower and cherry blossoms at Munich International Airport. Should you stay at a hotel close to Munich International Airport? If you have an early-morning flight, the location is convenient, because it will save you from having to allow time for a 40- to 40-45 minute S-Bahn, bus, or taxi ride from the city center. Otherwise, we'd recommend staying near the Hauptbahnhof (Munich's central railroad station) and catching the S-Bahn to the airport on your day of departure. That way, you'll have more to do in the evening, and you might save a few euros in the bargain. This ultramodern luxury hotel at Munich International Airport is a short walk from the terminals and the München Airport Center shopping mall. See our illustrated review of the hotel, which was designed by architect Helmut Jahn. The 257-room Novotel is geared to middle-class business and family travelers. All rooms are soundproofed, handicap rooms are available, and Wi-Fi is free. Photo: W. Hennies. Copyright © FMG. Used by permission.